For reliable building services in Dorset and Hampshire you can trust, don’t hesitate to contact the team at Croft Preservation today on 01202 737739. Over the last 30 years, our team of experienced builders have worked on all manner of building projects across Dorset and Hampshire, ranging from minor repairs and remedial works right through to extensions, conversions to full refurbishments. Whatever the type of building service you require, our builders are fully equipped to provide you with a safe, dependable and cost-effective service. We extend our building services to both commercial and residential customers alike and are more than happy to work alongside architects and other contractors to deliver any necessary works on their behalf. 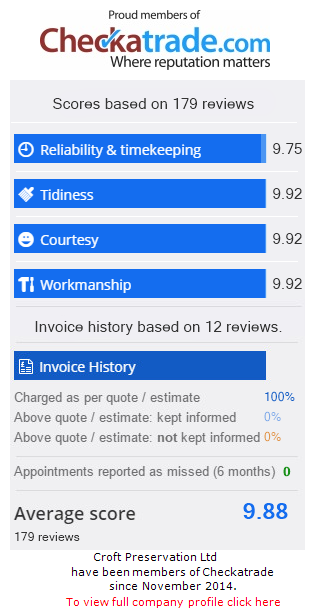 We are fully committed to providing exceptional customer service coupled with professional, high quality workmanship, not to mention value for money – all of which underpin our fantastic reputation as leading builders in Dorset and Hampshire. By combining our building knowledge with our expertise of damp proofing and timber treatment, we provide our customers with the peace of mind that any commissioned work we complete is intended for long-term success. For building services in Dorset and Hampshire that promise results on time and within budget, don’t hesitate to contact us today on 01202 737739. Our builders are registered members of the Federation of Master Builders and NHBC, as well as SafeContractor approved. Our range of accreditations are evidence of our dedication to providing clients with the best possible building services in a way that is safe, and industry approved. Whatever construction project you’re planning, our fully qualified builders are on hand to lend you their extensive knowledge and skill. Not only that, we have a network of carefully selected subcontract partners who we fully trust to deliver high quality building services whenever we need them. Contact your leading local builders today! Even when working in occupied homes or facilities such as schools and hotels. Our unrivalled building expertise ensures we consistently deliver our building services on time and within budget. We are a local building company with local values. Contact our friendly team today for a free, no obligation quote on 0102 737739.